' who's your daddy? - Sisters, What! 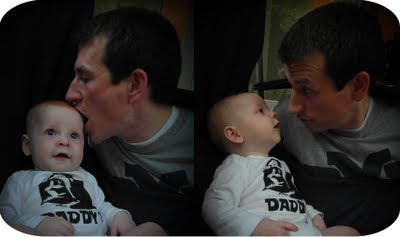 He looks pretty happy to know who his daddy is. 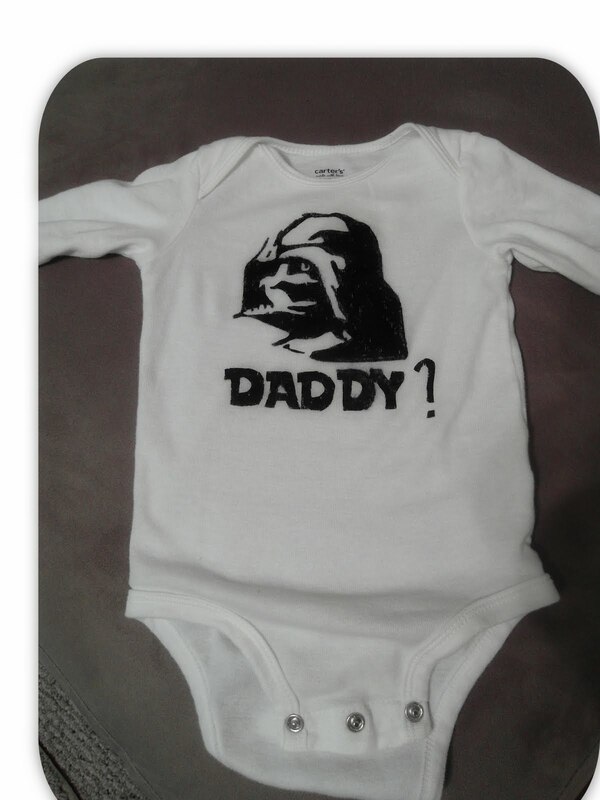 Now I just need to make Brigg a shirt that says "I am your father!" I used the freezer paper stenciling technique and couldn't believe how easy it was. Because I don't own a silhouette or cricut, i had to use an exacto knife to cut my stencil out, so that was the most tedious part. To do it yourself: 1. pick your image or words you want and print them out. 5. next iron on your stencil waxy side down; if you have little pieces (like the middle of letters o, d, or a) carefully place them where they belong. 6. After it is ironed on use any fabric paint and paint away. Wait for an hour or so and carefully peel off when dry. p.s. Here is the Darth Vader image i used as a stencil. Just save to your computer and in photoshop or microsoft increase or decrease to the size you want then print. AWESOME! I love it. I just feel bad that you never used my cutter to do this while you lived so close. I'm impressed! You totally should do the shirt for Brigg too. :-) Can't believe I hadn't make the Luke/Star Wars connection before, unintentional or not. Love this! Just had a star wars party this past weekend for my son who is turning 5! Thanks for sharing! This turned out Awesome!!! Love freezer paper stenciling!! So cute! I love those sort of stencils, you really can make any design! OH MY GOSH! My husband would die if he saw this. I'm scared to wield an exacto knife, due to a slicing of the finger in the past, but I just might have to try again here soon. That is awesome and you did an amazing job on it!! Well done! 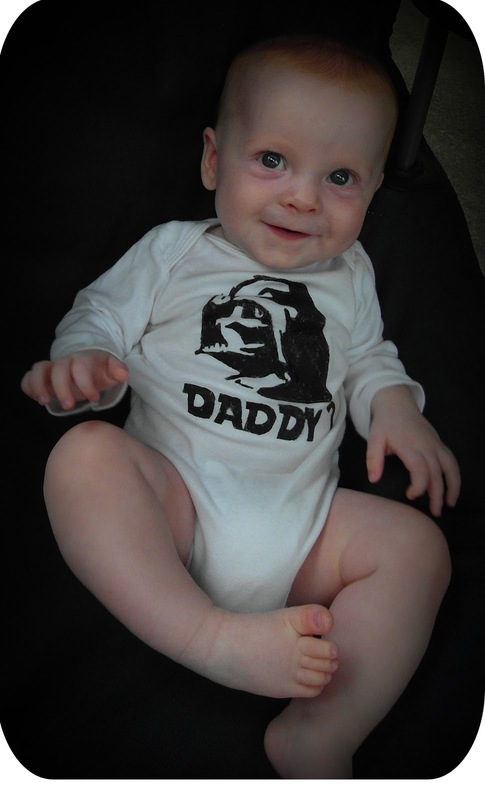 My son's name is Luke and he is certainly getting one! What a great idea! My husband is going to love it! Thanks Havalah! You inspired me to make a little football jersey onesie for my Cora but mine did not turn out neat and crisp like yours! Next time I will have to remember to use fabric paint (instead of acrylic) and iron the edges better! Thanks again!